Ship Notes: Look for NEW IMPROVED MODEL SC886F, Avilable Now, Fast Free Shipping. The Original Time Tested, Time Saver. On Sale $219.95, with Fast Free Shipping the Sanitaire upright SC886E is UL listed and designed with the exclusive Quick Kleen feature that allows for easy access to the fan chamber. The 12-inch cleaning width, six level carpet adjustments and 50-foot power cord combined with the Vibra Groomer II chrome steel brush roll, large easy-roll wheels and chrome steel hood help to extend the life of these machines, plus save time and money. The SC886E has a shake out dust bag system. This Sanitaire model is the choice of extraordinary cleaning performance and long life. Click here for In Depth Look of the SC886E: View video demo. Quick Kleen fan chamber lets you view, service and access the impeller fan for reduced maintenance time. Office mangers and hotel/motel managers know it's important to take care of the housekeeping staff because their handiwork is the first thing guests notice. Sanitaire has introduced new cleaning tools that offer top commercial cleaning performance while making vacuuming work less of a workout. The new Sanitaire, models SC886E is durable, quiet and easy to empty, three features that every member of the cleaning crew can appreciate. 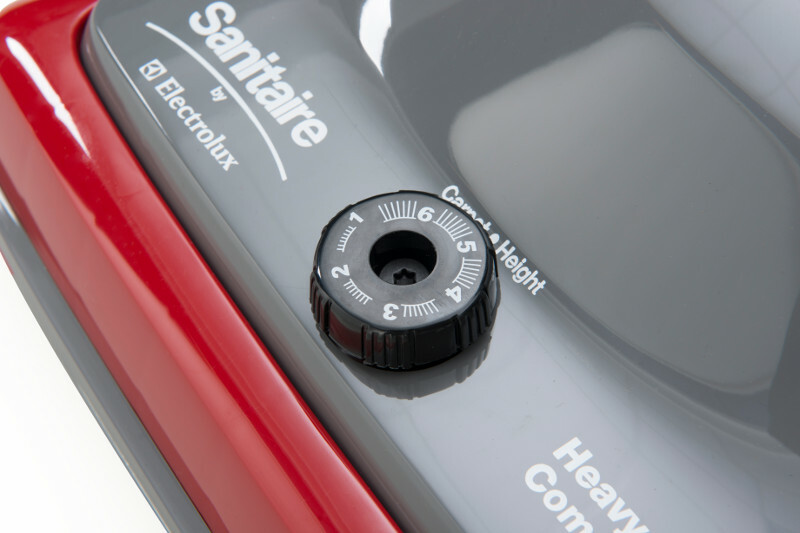 The Sanitaire SC886 is 7-amp upright cleaner with a Commercial UL listing. have a lower noise level than standard units. The clear bumper protects walls without leaving marks and the long life chrome steel handle and 50-foot, 3-wire cord last through the toughest use. Consider the SC886E Sanitaire Upright, models SC886 when it's time to replace the cleaners in your fleet. This model have all the power, all the features and all the durability with extended life motor. Your cleaning crew will thank you. Durable chrome hood and a double ball-bearing brushroll with replaceable bristle strips means you save on maintenance costs. Model SC886 have the vibrating action of the chrome steel ball bearing brush roll, Vibra Groomer II®. Commercial cleaning has never been easier with six carpet level adjustments, a 12-inch cleaning width and 50-foot power cord. Save time and money with these long-lasting uprights that have large, easy roll wheels and a chrome hood cover.